This graph can be created by the users directly from the Secure and Above, By Term graph above. 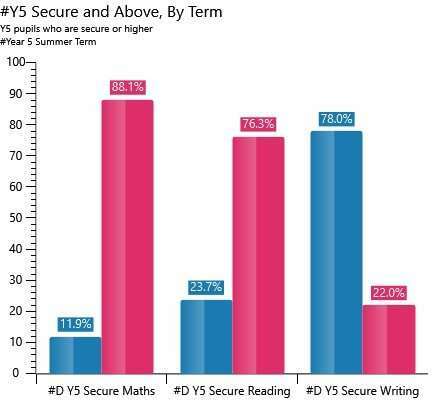 The intersection of the graph shows the number of pupils who have attained the ARE in reading, writing and maths combined. These graphs are intended to show progress by averaging the grades attained by pupils. 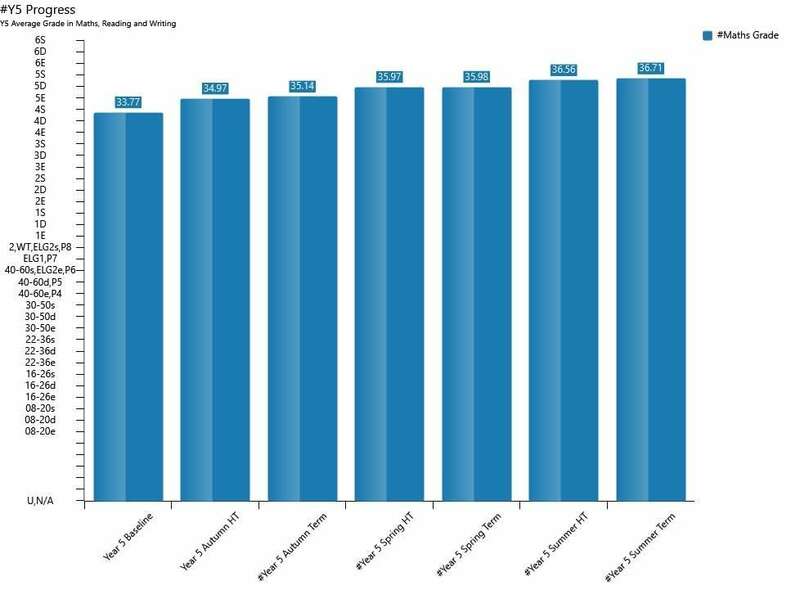 These graphs lend themselves to comparing the progress of groups within school using graph to graph filtering – taking a bar from another graph (eg pupil premium pupils) and dragging it across over to this graph will create a new set of bars that represent the progress of just the pupil premium pupils. School Analytics provides one of these graphs for each year group – six in total. The graph includes all three subjects but you can view or hide the subject you wish to analyse. There are 18 attainment graphs provided by School Analytics, one for each term within each year group. 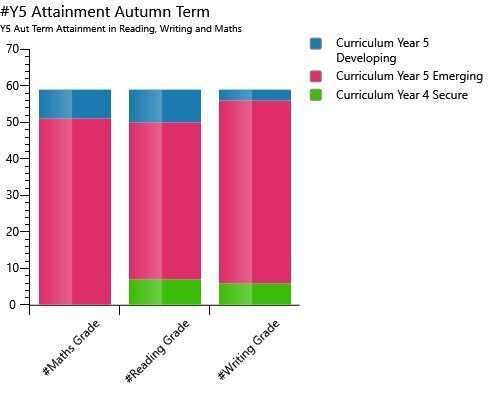 The graphs give a simple stacked bar chart that shows the number of pupils at each possible grade within the cohort. Note that the groups you see down the left hand side of the grid can be changed. When you order School Analytics Advanced we’ll set these groups up to your specification. You can also add your own groups to this list after installation. School analytics includes six of these grids (one for each year) and each grid can analyse any of the three core in any half term. These are the most useful group analysis grids. Compared with analysing data within a marksheet, using these grids saves hours of senior leaders’ time. Each grid shows the percentage (or count) of pupils in each of the age related expectations for the selected year group. The final column gives a cumulative ‘at or above’ figure that includes the mastered/greater depth pupils. The marksheets calculate how far each pupil has progressed by comparing the baseline grade with the current term. The difference between the two gives the number of grades progress. This is then analyses in the grid format shown above. School Analytics provides six of these grids, one for each year. Six of these grids are provided, one for each year group. They show the spread of grades for a particular year and are especially suitable for schools which have a wide range of pupil abilities in each year group. This analysis grids allows comparison of all subjects side-by-side. Again six grids are provided. 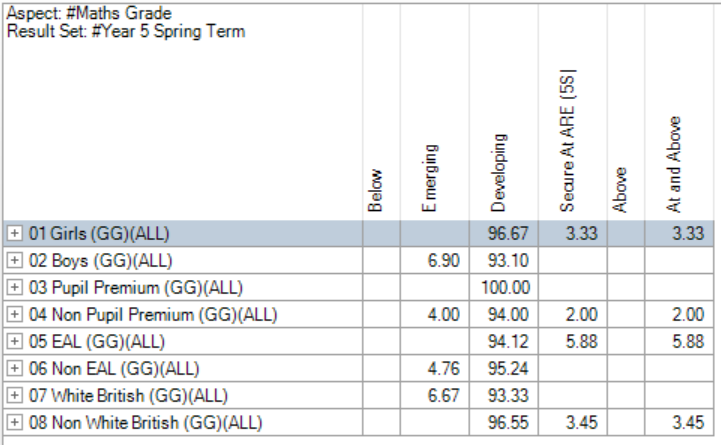 An analysis of progress grade, for each subject. Six grids are provided, one for each year group. Tracking grids provide similar analyses to analysis grids (above) but they focus much more on pupils. Analysis grids are usually used by governors, senior leaders and school improvement professional. Tracking grids are usually used by teachers. 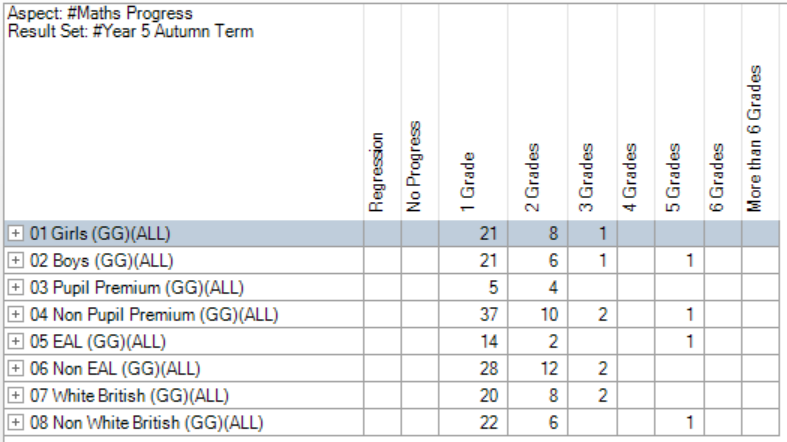 School analytics provides 12 tracking grids, six to show progress and six to show attainment. Six progress tracking grids are provided, one for each year group. Each grid allows analysis of every subject. The grid shows how many grades of progress are expected using grey target cells. The traffic light analysis columns show how many pupils have made less, expected or more than expected progress. This tracking grid shows attainment compared to age related expectations. 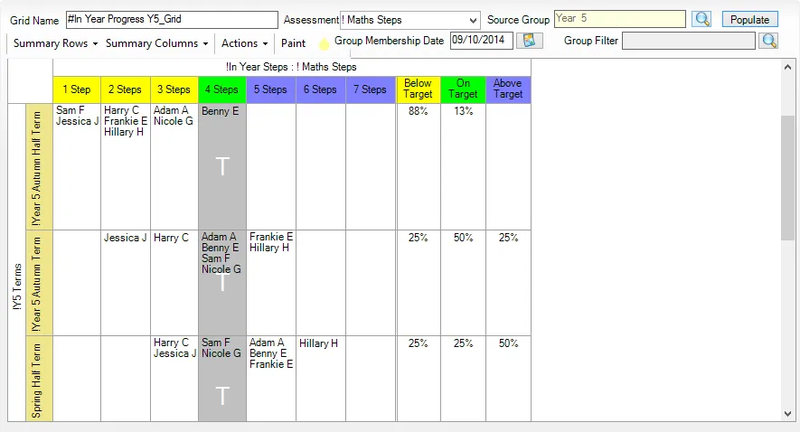 Six attainment tracking grids are provided, one for each year group. 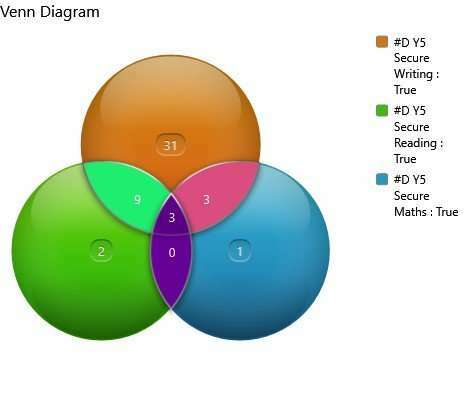 Age related expectations are indicated by the grey target grades and the traffic light analysis columns show how many pupils are below, at and above ARE.